Unlike Boston, there is no Baltimore accent. And its uneducated idiots from the inner cities who refer to the police as the 'po-leece'. Even though I watched it on FX and then bought all five seasons on DVD, I will be tuning into BBC2 tonight to watch every single, glorious episode again. Perhaps now The Wire will get the audience it deserves having suffered at the hands of the overrated Six Feet Under and the once great, but ulitmately, disappointing, Sopranos. No Baltimore accent? Au contraire, Mr. Anonymous. 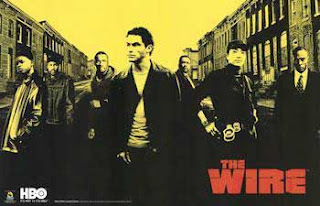 The Wire is a great series. And as much as I liked Season 1, I thought Season 2 was almost operatic in its intensity (the dockworkers story). Loved it. I'm in the midst of Season 3 now. Uh, there is a DEFINITE Baltimore accent. I live in Germantown, MD and everyone I know makes fun of the Bawlmore accent. The Wire is fantastic. I wish the BBC had the guts to make drama like HBO does. Season 3 is a bit of a low point IMHO, but it picks up with a new & more interesting focus in Season 4 and Season 5 is awesome. Season 4 is the best, with Season 3 following it. Two is generally considered the weakest. The above site is probably the best Wire discussion blog I found. It is no longer updated, but the people writing and commenting do so at a very high level. I believe it starts somewhere in the third season.